Not so long ago, silo towers dominated the countryside in Southwestern Ontario, but as agricultural technology changes, so does the rural landscape. These concrete towers are demolished or felled with equipment or dynamite into heaps of rubble, with nothing but old photographs to remind us where these sentinels once stood and of the stories of people who built them. More recently, people have been finding new uses for these structures, preserving history in the process. In North America, tower silos weren’t developed until the late 1800s. Until then, as in Europe, feed was stored in pits in the ground to be fermented and preserved. Fred Hatch, an Illinois farmer, build up sixteen-foot walls around his pit to make a storage tower within the barn in the 1870s. Franklin Hiram King, a Wisconsin agricultural scientist, then developed a tower silo structure with a separate roof. In Ontario, from the turn of the last century, silos were made of wood. Stave silos were constructed from the 1930s onward and made of concrete slabs held together by steel hoops, like enormous stone wine barrels. But, unlike wine, it isn’t good for high-moisture feed to breathe. So, poured concrete silos were an improvement, creating low-oxygen environments for better storage and feed quality for dairy cattle. As time went on, silos were built taller and taller. The iconic blue Harvestore silos were developed by A.O. Smith in the 1930s by using glass-fused-steel tanks and went into production in 1949. In a tower silo, chopped high-moisture corn and grass is loaded from the top and compressed under its own weight to ferment in the low-oxygen environment for use throughout the year. Harvestore silos developed technology for bottom-unloading and breathing bags at the top which control oxygen infiltration. These days, tower forage silos are still being built but most dairy farmers prefer the horizontal ‘bunker’ silo. However, concrete grain bins are an improvement on corrugated steel bins because they moderate temperature for dry grains. These bins are made in much the same way as silos were a century ago, only wider and taller. Working quickly with circular forms, layers of cement are poured onto a previous layer which has not completely cured. While earlier silos went up sixfeet a day, these grain bins can go up 12 feet a day, usually completing a large bin in two weeks. For safety, many of these older silos are coming down. But for some, they have been given a second chance at life. The Quaker Oats facility in Akron, Illinois consisted of 36 grain silos built in 1932. Housing 1.5 million bushels, each silo was 120 feet tall and 24 feet in diameter. After closing in 1970, the facility was repurposed and became a Hilton hotel in 1980, with 196 completely round rooms. It is now a student residence for the local university. In 1993, Leonard Hassett bought a property in Denson, Iowa with twin silos that had been built in 1967. He retrofitted them into a home and was featured in the August 2, 1997 edition of the Iowa Farmer Today. It was this article that inspired Stewart Simpson of Middlesex to do the same. While tower silos were an innovation unto themselves, the next generation of innovators are preserving them as homes. Simpson was born in 1921 near Glencoe, dropped out of school when he was 13 and farmed all his life, specializing in egg production. He purchased a Piper Cub airplane in the late 1950s and was a charter member of the Ontario Flying Farmers. In the 1980s, he purchased the farm adjacent to his childhood home farm, which was that of his great-grandfather’s brother, William Simpson. Four Simpson brothers had come from England in the 1830s and homesteaded there along the Thames River. In 2004, Stew left the poultry farm under the management of his son, Peter, and moved to his ‘Old River Farm.’ Inspired by Acres USA and the memories of farming during his childhood, Stew became passionate about the potential of modern biological farming. Turning 90, he introduced a herd of pure-bred North Devon cattle to Middlesex County. Also in 2004, Simpson began renovating an unused silo on the property. The silo was built in 1968 - at least that is the year drawn into the concrete base beside two sets of handprints. Simpson finished the silo project in 2016, the year he died. The concrete walls are thinly insulated and a staircase winds counter-clockwise around the outside wall of the silo. The first floor is a mudroom and entryway, the second is the kitchen and a dining room addition, third is a bathroom and guest bedroom and the fourth is the master bedroom. Above that, the remainder of the silo is open to the domed roof, a giant echo chamber. 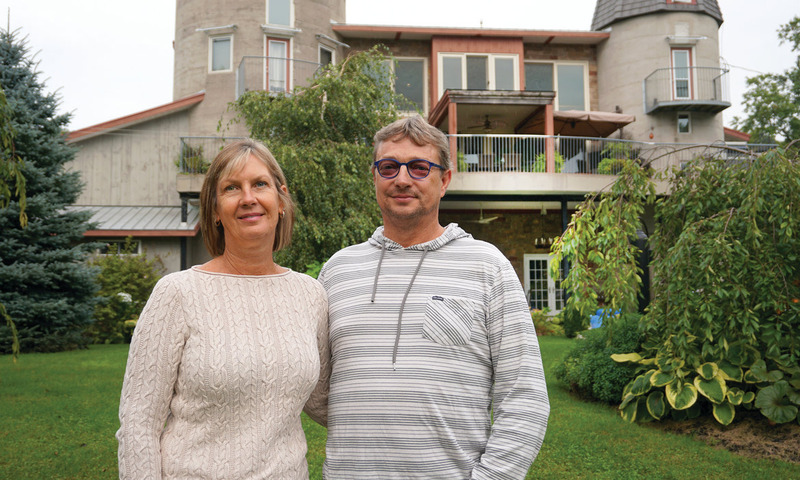 She and her husband, Ross Snider, move to the silo every summer to enjoy the property. “It is comfortable in the summer because the concrete keeps cool and there is a nice cross breeze through the windows,” she says. Ross manages the farm and Mary is involved in the Alternative Land Use Services (ALUS) committee for Middlesex County. They recently collaborated with the Conservation Authority and Ducks Unlimited to create a wetland and tall grass prairie on the river flats of the Thames. “Stew did everything his way,” she remembers. “He actively farmed until the end of his life and when his health failed, he refused medical care.” Stew died at the age of 94. Hugh Burgsma, owner of Complete Construction Inc., had originally been looking for a new location for his shop. Though they lived nearby, they’d never been up the Saltford hill and when they saw a For Sale sign at the top of the hill in 2005, they took a better look at the property. They saw two silos, 13 feet and 18 feet across and 30 feet apart, and the foundation of a barn in a tumble of overgrowth. The farm had ceased operation in 1972. While many others had seen the silos as an expense to demolish, Hugh saw something entirely different. “The first thing he did was run home and get a ladder,” laughs Kim. “I thought, we could do something really cool here,” says Hugh. “In 20 minutes, I had the whole plan in my head and down in a sketch.” Hugh was always a builder; his father was a carpenter and he started on his own in 1986. It would be 2008 before they finished the home upstairs, and for many months the family lived in the shop area. “Being a builder’s family, we were used to it,” says Kim. The shop is on the first floor and a three-storey home is above that. Silos form bedrooms and lofts connected by a catwalk, a grain bin forms a separate dining space and an open concept living room and kitchen cover the space between. Balconies and windows look west across the valley toward Goderich and the lake sunset, while the original foundation of the Bisset barn was filled in and Kim landscaped a beautiful garden into the footprint. While they were excavating, the couple found a buried sidewalk that ran from the barn to the creamery, which still stands. “Working within circles was the main concern,” says Hugh. “Some people didn’t want to deal with it, so we ended up doing a lot of the work ourselves. It isn’t really that hard, just different.” To meet building codes, he had to reinforce the base of the silos and put metal straps in a few places to maintain the structure. He also received a minor variance to his building permit because the house is technically four storeys if the shop is included. “By incorporating them into the house, the silos can stay here and tell the story of the Bisset farm,” says Hugh. The 2,400 square foot dream home is currently for sale. The Burgsmas love to preserve history and, clearly, love a challenge. Eight years ago, they purchased and renovated the Samuels Hotel in Saltford (named after Samuel Bisset and Samuel Platt), which was originally the Colborne schoolhouse built in 1864. They also recently finished renovating the 1859 home of Bruce Sully, President of Champion Road Machinery, into five luxury condominiums. “How else can we preserve a historic estate like that unless it is made into something practical?” says Hugh.